Learn about cartography and underwater cave diving with Eric Hutcheson Wednesday, Feb. 20, at the Port Orange Regional Library, 1005 City Center Circle. 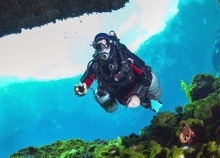 The experienced cave diver and founder of the Silver Springs Cave Diving Team will speak to adults at 1 p.m. and teens at 3 p.m.
Over the past two decades, Hutcheson has mapped cave systems in Florida and shot cave diving segments for the Discovery Channel and PBS. Reservations are not required for the free program. For more information, call the library at 386-322-5152, option 4.